The internationally best-selling, award-winning Japanese thriller about a child who may be the future of the human race - or the cause of its extinction. During a briefing in Washington D.C., the President is informed of a threat to national security: a three-year-old boy named Akili, who is already the smartest being on the planet. Representing the next step in human evolution, Akili can perceive patterns and predict future events better than most supercomputers, and is capable of manipulating grand-scale events like pieces on a chess board. And yet, for all that power, Akili has the emotional maturity of a child - which might make him the most dangerous threat humanity has ever faced. An American soldier, Jonathan Yeager, leads an international team of elite operatives deep into the heart of the Congolese jungle under Presidential orders to destroy this threat to humanity before Akili's full potential can be realized. But Yeager has a very sick child, and Akili's advanced knowledge of all things, medicine included, may be Yeager's only hope for saving his son's life. Soon Yeager finds himself caught between following his orders and saving a creature with a hidden agenda, who plans to either save humanity as we know it - or destroy it. An intelligent science fiction/ suspense novel. I rarely write reviews however this book is excellent -- most of the time when I take a chance I am disappointed however this book is one of the best I have listened/ read this year. 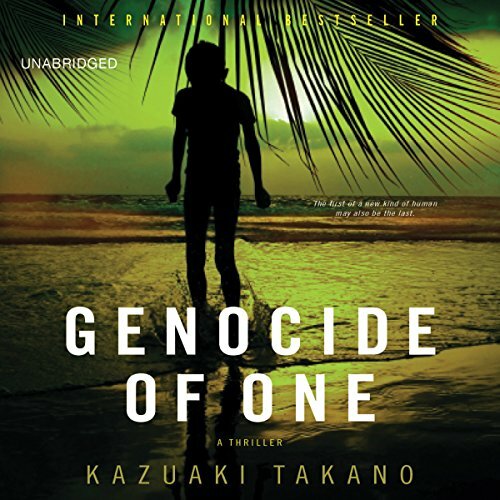 Kazuaki Takano's thriller, Genocide of One is a near future action tale with an evolved human going up against global state sponsored spy and anti-terrorism groups. The basic premise is a really smart child that has been deemed a threat and must be eliminated. Then ensues a series of action and sleuthing scenes jumping from Africa to Japan to the US. The pacing is well done with an edge of your seat feel. The story falls down in its over the top approach. A decades old think tank report that had suggested the possibility of an evolved, super smart human arising and taking over the world has apparently been front and center on the US government radar screen ever since. As a result, when vague descriptions emerge that it might have happened, plans are set in motion to eliminate the threat. The child however, has also anticipated this possibility and set in motion his own plans to fight back (which includes murder and mayhem). At the same time, the child has time to develop software to create a drug tailor made for the child of a mercenary who will get him to safety. The narration is well done with a solid range of characters of various ethnic backgrounds. The tone and mood are well suited for the fast paced actions. great attention to detail and history. interesting story. very thought provoking. very similar to Michael Crichton. a little overdone. overall still great. I loved it! The stories intertwine beautifully, and the reading is engaging. I recommend it highly! Timely and gripping. Appropriate for any age but perfect for teens and up. What happens next is really up to us.